Plans have been submitted for a 1,500-seat theatre and 1,000-capacity performing arts venue in the Olympia London exhibition centre. The new venues are part of a £700 million redevelopment of the West Kensington events space, which was first announced in July. 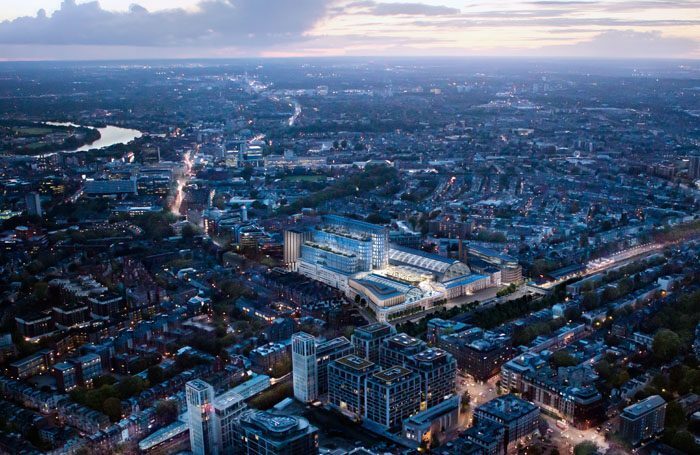 Now the owners of Olympia London, Yoo Capital, have requested planning permission from Hammersmith and Fulham council. The planning documents reveal further details of the proposed performing arts offering, with developers aiming to create a “cultural hub” in the area. As well as the previously announced 1,500-seat theatre, there will also be a flexible performing arts venue with a capacity of 1,000 seated or 3,000 standing, which will be used for music and potentially also for theatre and dance. There will also be 10,000 sq ft of performance rehearsal space, which will be primarily for use of local charities and community groups, free of charge. The build cost of the performing arts offering at Olympia London will be tens of millions of pounds, the owners have said. No further details have yet been released about the programming or preferred operator for either venue. Chairman at Yoo Capital, John Hitchcox, said: “The masterplan represents a phenomenal opportunity to invest in the existing exhibition business, while opening Olympia London up to the whole community by providing new cultural facilities in the arts, music and entertainment industries.